was a New Orleans parade-master like most of us would be, if we could. He was born in New Orleans and became an artist renowned in his hometown and abroad. His work graces iconic metropolitan spaces like the walls at Gallier Hall on Saint Charles Avenue (1862 City Hall, when New Orleans fell to Farragut's landing party). His rendering of Artemis, Greek Goddess, twin of Apollo, tops the pediment at Harrah's Casino on Canal Street. And his works rest in museums around the World. "Show me someone with those credits," L. A. Norma said, flicking a Camel Cigarette from the steps of the Patrick Taylor Library at the Ogden Museum of Southern Art, "and we'll both be looking at some-great from Big Swamp City, New Orleans." We are here for Dureau's memorial starting inside momentarily. The Library is tucked behind the Confederate Museum, housing swords and remnants of New Orleans first Carnival. Commenting once on the old museum's dreariness, Dureau said he would do it as a"Roman romp." Why he didn't romp too far from home. Like they say in France, "Why travel when you are here!?" Dureau grew up along Bayou Saint John and never moved too far away. "I lived in twelve houses," he told Otis Fenneley, in a You-tube video biography by David Zalkind. 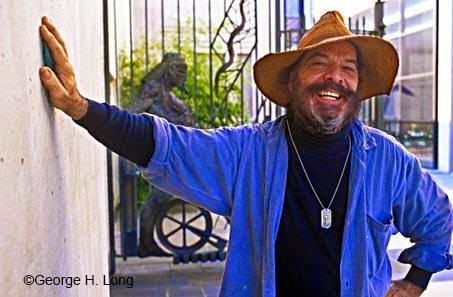 The three are standing on Frenchmen Street outside FAB, Fenneley's Faubourg Marigny Art and Books. Fenneley was not born here, but both men are true sons of New Orleans and longtime friends. Zalkind in earlier days clerked at the bookshop. "The elder artist stopping on his bicycle ride through his epic memories to visit his old friend and shopkeeper," Norma whispered. Fenneley constructed a window-memorial from some old charcoal sketches and fragments of broken sculpture. It faces Chartres street traffic and the tourist-popular Praline Connection restaurant and candy store across the street. Dureau attended Louisiana State University in Baton Rouge. Then came back to his succession of, "Thirteen homes - if you count the last one," Norma whispers. Once he lived in an exquisitely dilapidated mansion on Esplanade Avenue. Another time, in a large second-floor space overlooking Cabrini Park (the dog park in the Quarter) from a curved gallery over a street-level book store named Kaboom (post-Katrina, moved to Houston). Its erudite owner was famous in the neighborhood -- as Dureau would say, opening his hands beside his large face, "For knowing more about everything than anyone else cared to know." made Dureau's portrait during a visit arranged by Arthur Roger. It is reproduced on today's memorial program. Arthur Roger Gallery exhibited both men. In his strikingly handsome youth, Dureau drove an open-air black Jeep with his raven hair and beard flowing in the wind-stream. And when he grew older, he sold the Jeep and rode a bicycle daily around the Quarter. His career began as a window dresser at Kreeger's Department Store on Canal Street. And his most productive years were lived in the Quarter. Variously near such notables as Ruthie the Duck Lady, who once told Dureau, he remembered with glee, "George, we are almost all gone." Also nearby lived Clay Shaw (acquitted of killing JFK). And William Fagaly, longtime curator at the New Orleans Museum of Art. Fagaly, along with the English art critic, Edward Lucie-Smith, played significant drums in Dureau's parade. Later he met Kate Nachod, who worked as a research librarian at the Louisiana Supreme Court on Royal Street. He walked her from car to Court. "A famous artist makes me breakfast," the smitten Nachod told her friends. She watched over him in his final years. The two effectively adopted each other. His was a life lived large, with his last breath drawn -- thanks to Nachod and the Arthur Roger Gallery drumming fans, friends and admirers for funds to do so -- in a nursing home in Kenner. "The place of airports and final departures," Norma whispered, under The Library's cathedral ceiling made from hundred-years-old cypress. Kenneth Holditch, Tennessee Williams Professor Emeritus at the University of New Orleans gave eulogy remembering he had delivered the same for Dureau's Mother's memorial. "He asked I do this for him, today." Dureau moved effortlessly amid the classy milieu of Uptown parties and Downtown romps, and on-the-Lake soirees at the sprawling palace of the late Mickey Easterling. Both died in 2014, around age 83 / 82, during the time of Louisiana's great music festivals in New Orleans and Lafayette. Otherwise they would have attended each other's funeral. And then gone off to hear the music. George loved I Want A Little Sugar In My Bowl, Nina Simone. "It was always playing at his studio, I am told," said New Orleans dapper physician / TV-commentator on civic health, Doctor Brobson Lutz, though born in Mississippi, another true son of NOLa. Lutz is considered the go-to guy by many in the press. You may recall him quoted in the New York Times after Hurricane Katrina, prescribing a beer and seeing to it the only two bars open had ice. A noted art collector, Lutz displays Dureau's work in his Uptown offices, and keeps a prized triptych in his French Quarter dining room. We talked at Mickey Easterling's feast and funeral. "That's a new take on the old New Orleans' adage about eating meals while discussing eating-meals, huh?" ~ L. A. Norma.